The International Biscuit Festival in Knoxville has given rise to all sorts of creative alternatives to the fluffy buttermilk standard. The bake-off, a festival favorite, has served up sweet potato casserole-flavored biscuits, Cajun, and even the Fat Elvis, an indulgent creation of peanut butter, banana, and bacon, which took top honors at the inaugural event in 2010. Better Homes and Gardens and The New York Times are open to writers and Southern food fans. 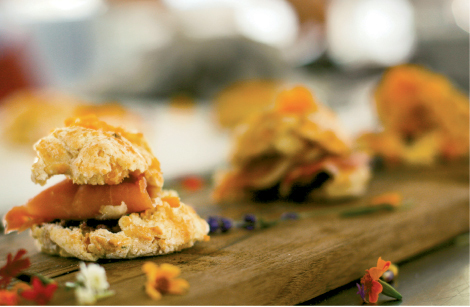 On Saturday, get your fill during the Biscuit Breakfast or enjoy a brunch prepared by chefs from acclaimed Blackberry Farm. After wandering Market Street, aka Biscuit Boulevard, to sample bites from more than 20 restaurants, attendees can cast a ballot for a people’s choice winner. The bake-off starts at noon, and judges will crown the grand champion from the top three bakers in four categories: savory, sweet, student, and special. Between nibbles, check out the Miss and Mr. Biscuit Pageant, when contestants demonstrate poise by walking across a stage balancing a plate of biscuits on their heads. The rest of the fun is the gravy on top.